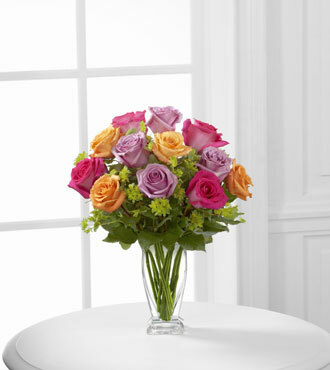 The FTD® Pure Enchantment™ Rose Bouquet blossoms with brilliant roses in bright hues to capture your special recipient's every attention. Hot pink, lavender and orange roses create a splash of color accented with lush bupleurum to make an exceptional flower bouquet. Presented in a modern clear glass vase, this rose bouquet is set to send your warmest wishes for their birthday, as a thank you gift or to celebrate any of life's special moments. GREAT bouquet includes 12 stems. Approx. 18"H x 12"W. GREATER bouquet includes 18 stems. Approx. 20"H x 14"W. GREATEST bouquet includes 24 stems. Approx. 24"H x 18"W.